One of my two wise grandmothers used to quote an ancient and vital saying: “Health is wealth.” If your health is intact, you are free to explore, develop and improve your life. When suffering poor health, you are confined to tending to the body’s well-being, nearly to the exclusion of everything else. Therefore, a small investment in health can provide big returns. I’ve been blessed with an active mind and a searching soul. Due to a powerful need to improve my health and expand my spirit, I was drawn to a path of dietary discipline and the deep wisdom it can yield. That path has led me to the gift of brothing. I invite you to share in my practice and my joy. The purpose of this work is to provide you with all the information you need to create your own broth, to find what vegetables serve your health best and to discover the wonderful benefits brothing bestows. You are welcome to give brothing a try. To access the full recipes, please consider the PDF and/or the Premium Edition for yourself and for those you love. Best to allow at least six weeks to see if brothing works for you. Please share your adventures, both rewards and challenges, so others may benefit. Feel free to email brothingguru@brothingguru.com with your results and questions, and I’ll do my best to respond personally. 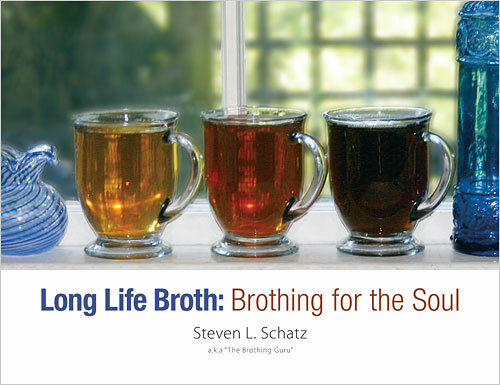 loved ones to Long Life Broth: Brothing for the Soul. So much inspiration and guidance along the way. Please see acknowledgments and credits.